Shannon Fisheries Meeting at Dundonald House. 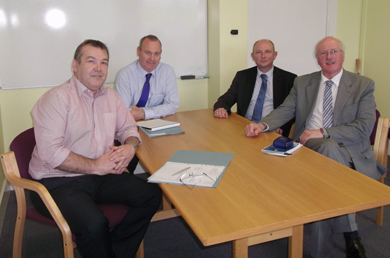 Strangford MP Jim Shannon (right) with , Nigel Edmunds from Portavogie and Fisheries officials Paddy Campbell and Ian Hume. Strangford MP Jim Shannon along with Nigel Edmund from Portavogie have met with NI Fisheries Department officials who have confirmed that their department have taken over control and allocation and management of the 100 ton quota of prawns for vessels 10 metres and under. He said: “This removes control from England and Wales where it once was and puts us now on par with Scotland who manage their prawn limit fully. There has been much concern and requests that a carry-over could be arranged quarter to quarter, and at the end of the year any unused quota is retained for the fishermen. It was also confirmed that the prawn limit is retained. Again this is good news for the fishing sector. “The managed prawn limit for 10-metre and under boats needs to be controlled for the fishing sector. Concern was expressed about the age of the fishing fleet and those who work in it and it is vital that introductions for new fishermen are encouraged – whether it is buying into quotas or boats.